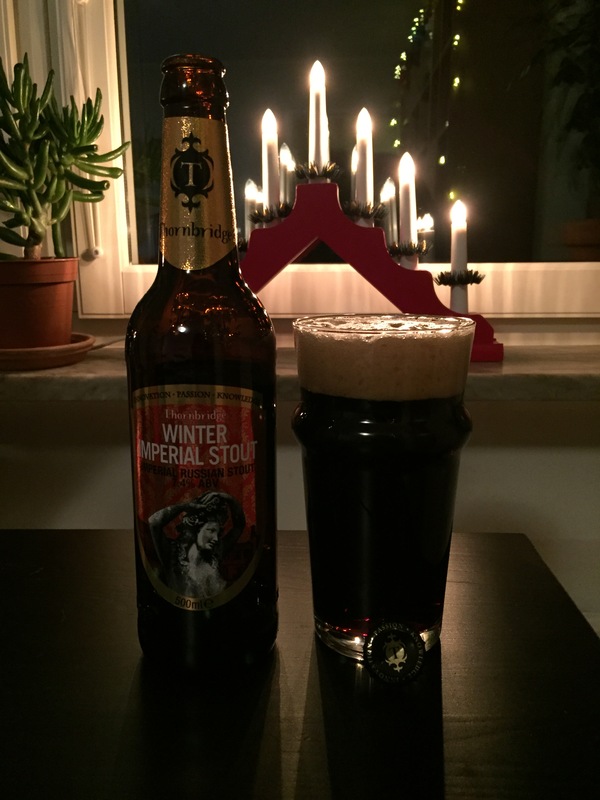 Thornbridge Winter Imperial Stout has a thick creamy (cream coloured) head that lasts forever and is extremely smooth to drink and a dark not quite black colour to the body. The aroma is full of chocolate and coffee with a hint of caramel and the flavour is more the the same with a mild roasted bitterness added to it and drying it out. The carbonation is low and the body is medium full and very creamy. Rating: 4.5 / 5 – Excellent beer and so very smooth and creamy, nothing bad to say about it at all. Mikkeller’s Santa’s Little Helper (not to be confused with the other Santa’s Little Helper appearing later) has a creamy whiteish head that didn’t last too long and a dark brown colour to the body. The aroma is mildly spicy and estery but not too strong and the flavour is roasted with some chocolate and coffee notes. The body is medium and the carbonation is medium. Rating: 3.5 / 5 – Enjoyable but not so great as to make me want a second. A little too heavy on the roast character and very little Belgian or spice character, a let down for a beer advertising both. 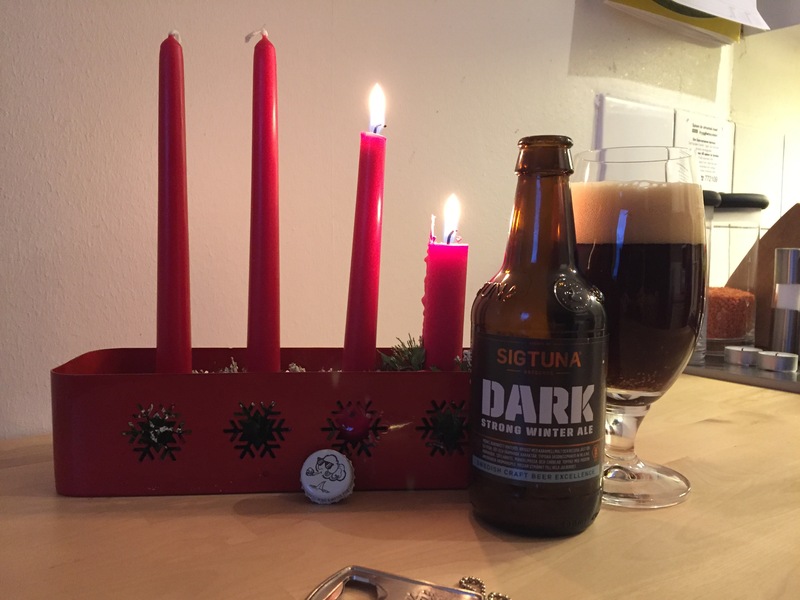 Sigtuna’s Dark Strong Winter Ale has a light off white head that stuck around for a few minutes and a dark almost black body. The aroma is full of various fruity esters and the flavour is malty with some fruit and caramel sweetness to it with a mildly bitter finish. The carbonation is medium-low and the body is medium-full. Rating: 4 / 5 – I could be drinking my own Lady Jane here, but with more alcohol. Very good beer, though I do prefer Lady Jane. This beer will likely age extremely well, so pick up an extra bottle to cellar for a year. 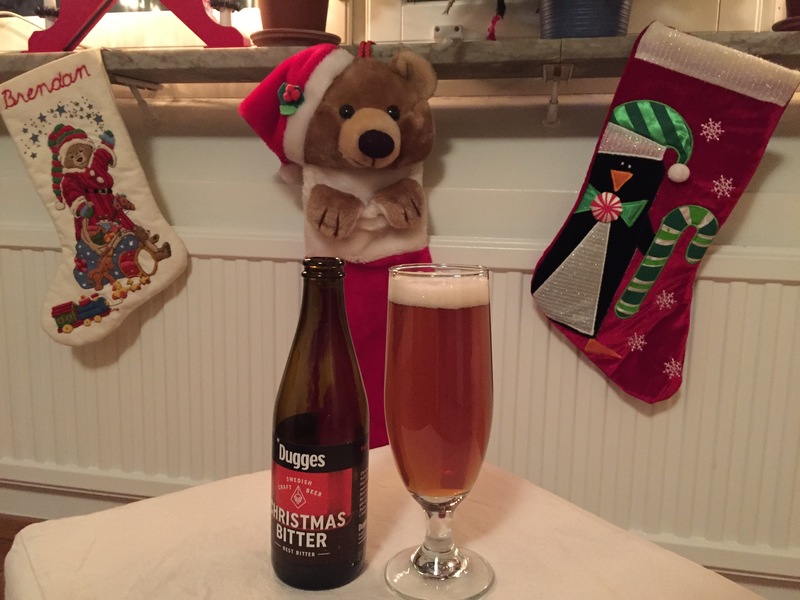 Dugges Christmas Bitter has a small white head that fades almost immediately and is orange in colour and perfectly clear to look through. 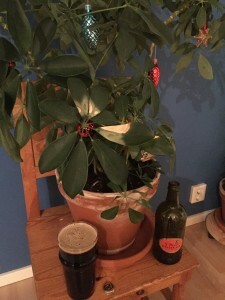 The aroma has a plum like character and a hint of sulfure, the flavour is malty with hints of chocolate and a mild bitter aftertaste. 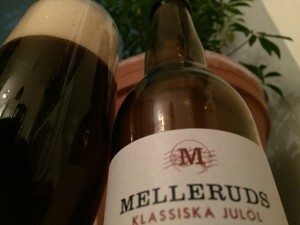 The carbonation is medium and the body is medium-light. Rating: 3 / 5 – Dislike the sulfur character in the nose, otherwise decent enough but not enough to want to drink it again. 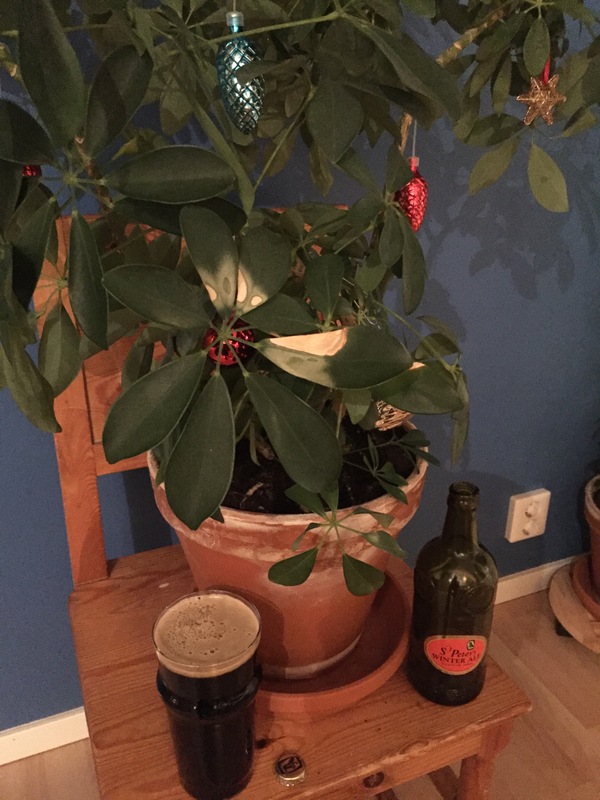 St. Peter’s Winter Ale had a small short lived cream coloured head and a dark almost black body with hints of red if it catches the light right. 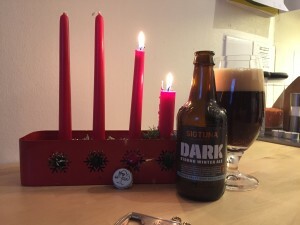 The aroma is roasty with hints of dates and raisins and other dark fruits like them, the flavour is rich and creamy with a distinct but not too strong bitterness that can only be attributed to the roasted character in the beer. The body is medium full and the carbonation is medium low. Rating: 4 / 5 – The roasted character is what makes this beer, balancing the sweeter caramel and dark fruit flavours. The creaminess of the beer makes it really pleasant to drink. Could happily sip on this for an hour. 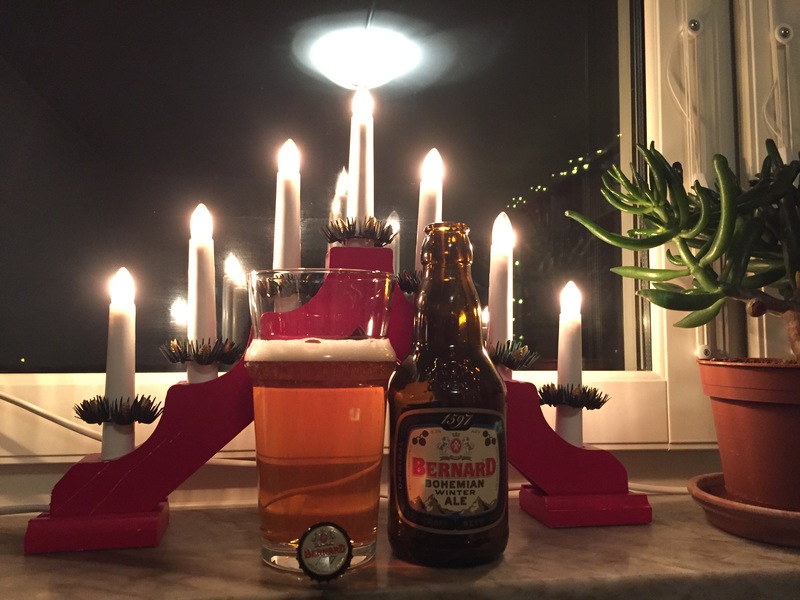 Pale in colour with a small short lived white head the Bernard Bohemian Winter Ale has a corn like character in the nose along with coriander. The flavour is pleasant, dry and mildly spicy without too much going on. There is no notable alcohol burn which is impressive in a beer with as little going on as this one. Rating: 3.5 / 5 – Tastes good but the nose is slightly off putting. I also keep thinking of it as a bohemian lager which throws me off when I drink it. Melleruds Klassiska Julöl has a light almost-white head that stuck around for a couple of minutes and a deep red coloured body. 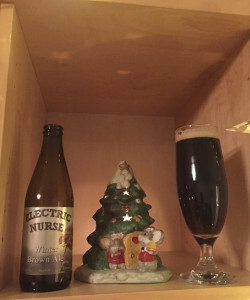 The aroma is malty and slightly sweet with grape like hints to it, the body is malty, full and slightly roasty but not without the sweetness noted in the nose. The body is medium-thick and the carbonation is medium. 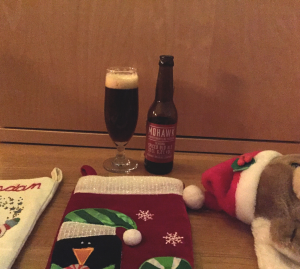 Rating: 3.75 / 5 – I love a good red ale and this certainly meets the criteria. Would be an excellent pairing with food. 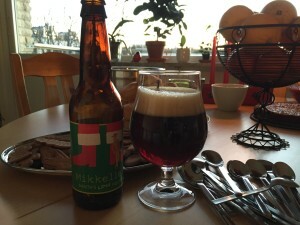 Midvinternattens Mörker by Mowak brewing has a light cream head that lasted a couple of minutes before disappearing entirely and a dark red-brown body. The aroma is full of spices, with cloves and cinnamon and hints of orange amongst other things. 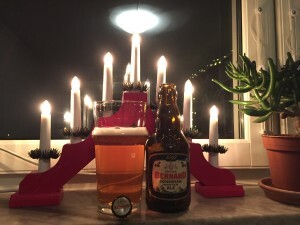 The flavour is malty overlayed with the spices that come through so strongly in the nose. Carbonation is medium low and the body is medium. Rating: 3.75 / 5 – A well rounded beer, the spices are strong but not overpowering and mix well with the malty body making it flavourful and nice to sip on. Electric Nurse Winter Brown Ale has a small cream coloured head that didn’t last very long and a dark brown body. The aroma is malty and slightly nutty but overall fairly weak, the flavour is similar with a slight acidic character to it. Carbonation and body are both medium. Rating: 3.25 / 5 – While certainly brown the beer is lacking in flavour and aroma, and while not bad by any means, definitely disappointing. 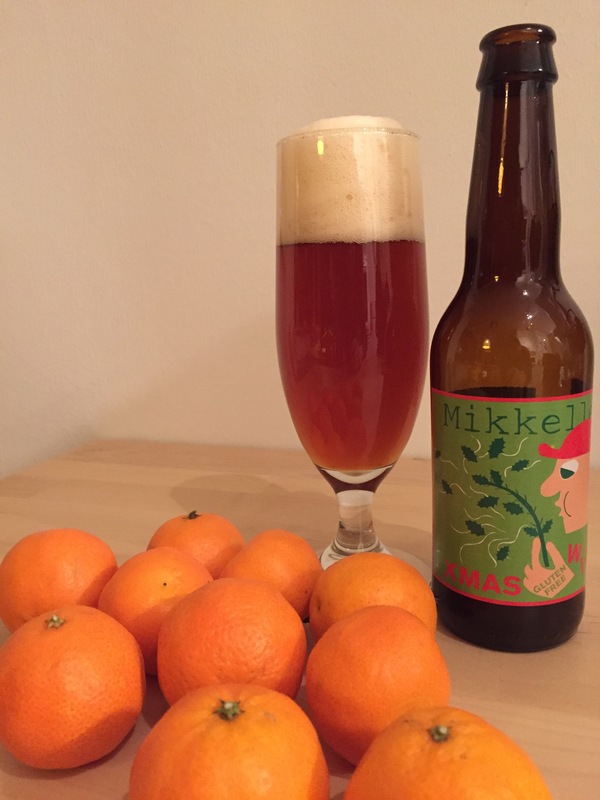 Gluten free beers are difficult to brew which makes Mikkeller’s XMAS WISH an intriguing beer to try. With an off-white head that didn’t last too long and a hazy amber body this beer has a mildly hoppy and citrusy nose to it. The flavour is crisp with a moderate bitterness to it and some fruity notes as well, the bitterness lingers for a while after the beer has gone down. Rating: 3.5 / 5 – Decent pale ale, if you don’t like bitter you won’t like this. Easy to drink and reasonably refreshing. A nice break from the mostly darker beers I consume at this time of year.